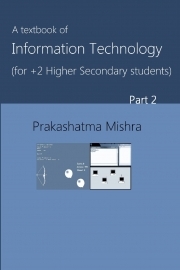 Description of "A textbook of Information Technlogy for +2 Higher Secondary Students"
The is the second part of the book that teaches how to write applications in Visual Basic. The book is written as per the curriculum of CHSE, Odisha for higher secondary college students. The author is a software developer best known for his free musical keyboard software, Click MusicalKEYS which he coded when he was in school. The program has been downloaded by thousands and is used in several schools like Larbert High School, Scotland, for teaching piano lessons to kids. The author is a Master of Science in Information Technology, and is currently developing security software to protect users from malware and viruses. Reviews of "A textbook of Information Technlogy for +2 Higher Secondary Students"